Many believe bottlenose dolphins (Tursiops truncatus) have jovial and clever temperaments, after seeing their many appearances in aquatic life shows internationally. Although many bottlenose dolphins reside in captivity, legions of them are found living in their natural environments -- oceans all over the planet -- which require some special adaptations. One convenient survival adaptation for bottlenose dolphins involves their swiftness. 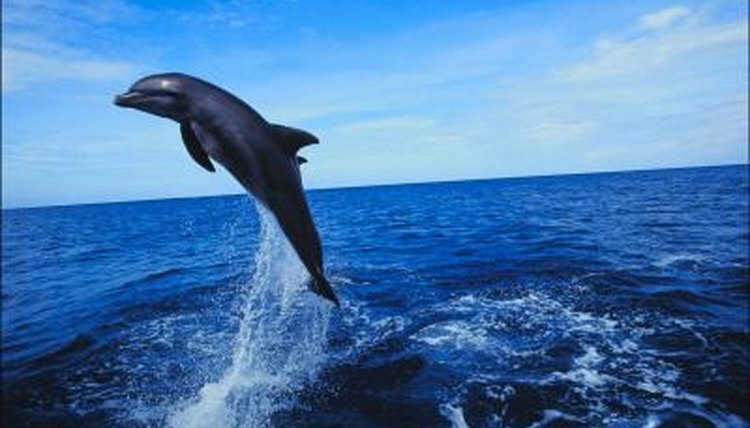 Bottlenose dolphins are extremely fast animals. Normal swimming pace for them is usually anywhere between 3 and 7 mph, but when they need to move quickly, they are capable of traveling faster than 18 mph. The faster bottlenose dolphins can move, the easier they can get away from their most prominent predators, which include bull sharks (Carcharhinus leucas). One quirky bottlenose dolphin adaptation is called "porpoising." To porpoise, they swim so rapidly that they rise up from the surface of the water. They emerge briefly from the water only to immediately go back down -- all in one gliding, singular motion. Bottlenose dolphins tend to do this several times in a row. This action isn't just for fun; it functions as an adaptation that zaps reduced amounts of energy when compared with normal rapid swimming, helping them conserve energy while still swimming fast. Diving is a major part of being a bottlenose dolphin -- it's how they find food. Bottlenose dolphins can hold their breath for as long as 12 to 15 minutes. The typical duration of their diving is 10 minutes or less. Although particularly deep dives aren't usually part of their daily lifestyles, they are part of their skill set. Bottlenose dolphins have been observed diving as far down as almost 2,300 feet. When compared with many of their fellow dolphins, bottlenose dolphins usually are a bit more limber. Most dolphins have neck vertebrae that are fused together, limiting their range of motion. Bottleneck dolphins, however, have only two of their seven neck vertebrae fused, allowing them more flexibility in their necks. Echolocation is an adaptation that helps dolphins, including the bottlenose, more easily track down prey. They start echolocating by making clicking noises. When these clicking noises reach an object or animal, they promptly bounce back to the dolphins. This provides the inquiring dolphins key information regarding the object or animal, from size to specific whereabouts. Like other dolphins, bottlenose dolphins have dense blubber, which stashes away calories and helps them survive when food is scarce.